Join us on Saturday June 24th, 2017 in Washington, Illinois for a one-day football camp and help us tackle Cystic Fibrosis! 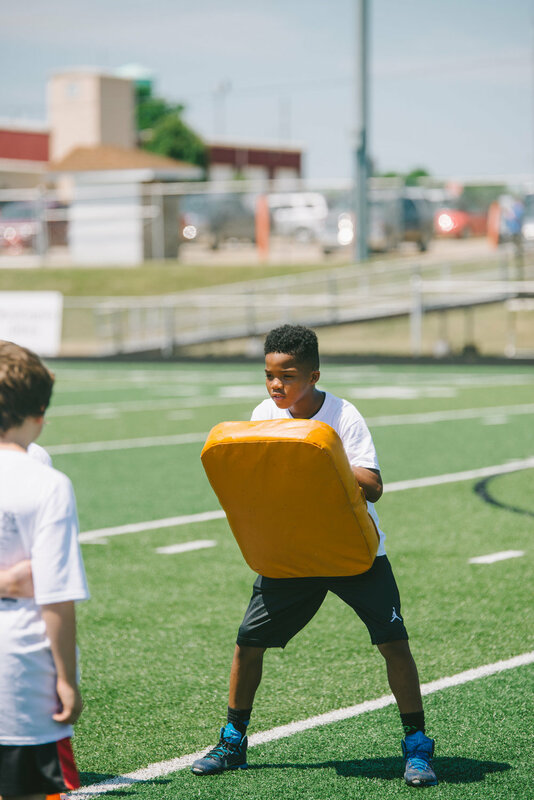 Campers will learn the basic fundamentals of football from NFL, College and High-School Players! This is the third year the Colton Underwood Legacy Football Camp will be hosted in his hometown. The goal and mission of the camp is bring awareness and raise money for the battle against Cystic Fibrosis. Throughout the day there will be plenty of opportunities to show your skills off. The main competition of the day will be a Punt, Pass, Kick competition. Prizes will be awarded to the winners of each age group! Campers will receive their T-shirts at Check-in the day of the camp. Additional T-Shirts will be available to buy on-site the day of the camp with 100% of the proceeds being donated to the Colton Underwood Legacy Foundation. Drop-off and registration parking will be available across from the high school. The only entrance to the field will be through the southeast gate near the Babcook Field sign on Jefferson Street. If you choose to stay and watch your child, designated and marked sections of the bleachers will be open for seating. Waterwill be provided for the camp participants. Please bring a water bottle to refill! Please have your child wear comfortable athletic clothing that allows them to easily move on the field such as shorts and t-shirts. Cleats are recommended but not required. There will be several NFL players at camp to help instruct and coach. They will be available afterwards for autographs. Camp will be held on the turf field at Washington Community High School. Drop-off and registration parking will be available across from the high school. Pick-up at the conclusion of camp will be in the lot across from Five Points Washington. Registration for the 2017 Colton Underwood Football Camp will begin on May 1st for children ENTERING 1st through 8th grades. Registration is on-line only. The camp registration requires a $25.00 donation that is non-refundable, but is tax-deductible. Drop-off and registration parking will be available across from the high school. The only entrance to the field will be through the southeast gate near the Babcook Field sign on Jefferson Street. Pick-up at the conclusion of camp will be in the lot across from Five Points Washington. After registering you will be notified of which team your child will be on. The teams are assigned randomly by the computer and CAN NOT be changed. All team selections are final. On the day of the camp you will take your child to their team table to pick up their shirt and name tag. After they have their shirt the child will proceed to the photo station. At that time we ask all parents and spectators go to the bleachers. You may sit anywhere on the West side bleachers or on the end sections of the East bleachers. The middle sections of the East bleachers under the press box will be reserved for the NFL players and camp teams only. This is to accommodate the photographers for the team pictures. The track, field and Panther Plex will not be open for parents or spectators. If you have ANY questions about on-line registration please e-mail us using the form below.